At 11 months, your baby is now old enough to be trying a lot of the regular table food that the rest of the family enjoys. If you feel that s/he needs more time, do not fret. Keep offering as much variety as you can and it will happen. Even though babies this age are able to chew or at least mash all kinds of food at this stage, make sure the food is well-cooked and mashed or cut into small pieces to avoid the risk of choking. By 11 months, babies are quite aware of everything around them and can communicate in some way about their needs. They are now on the brink of toddler-hood. As you plan a schedule or timetable along with meal plan for him/her, you should plan on giving at least three solid meals and one or two snacks. At the same time, ensure that baby is getting his/her quota of breastmilk or formula. At this age, gradually reduce baby’s milk intake to 3 to 4 feeds or max 32 oz and increase solids intake at the same time. If you are not sure whether you baby is getting enough breastmilk or formula, follow these tips. Give small quantities of boiled and cooled water along with solid food too. Give ample play time or floor time as that encourages baby to crawl/ walk. Baby will also be taking at least 2 naps still. Though these usually differ from baby to baby. Allow your baby to sit in a high chair and feed himself/ herself. Do not worry about the mess. This is the beginning of self-feeding and will serve you and your baby well in the long run. Take your baby out in a stroller to a park or outside. This helps baby to develop social skills by meeting new people. Graduate your baby from purees to thickly mashed food and soft chunks. Finger foods are great for this stage. As babies eat more and more solid food, they may have issues like constipation or diarrhea. Follow these tips to prevent and relieve constipation and diarrhea. Hope this food chart will help you in planning your baby’s food. If you like it, do share it in your circle. Do leave a comment to ask a question or let us know your feedback. You can follow us on Facebook, twitter, YouTube and pinterest. I have a question.Can idlis be had for lunch dear?In the food chart it is mentioned as lunch on wednesday.Since Idlis are very light and get digested easily,I’m doubtful whether you can use it for lunch.Kids might feel hungry after a while.I suggest it would be better for dinner.What do you say Priya? Idlis are absolutely fine for lunch, if your child likes them. They are wholesome and with sambhar form a great meal. You should use your discretion, however. but my 1 year baby is still in puree condition of food.he has only 3 teeth.how he is able to chew all these thing in solid. My baby is 11 month old but yet prefers to eat pureed food. He kind of feels like throwing up for small solid bits in the puree. In the chart it has mentioned dosas and pancakes will they be able to complete that meal. He likes eating finger foods but sometimes chokes himself. Can you please suggest some solid finger foods that can be eaten without choking? All babies are different. So, while many babies are able to chew well by 11 months, some babies may take a little more time and it is fine, as long as you are giving them ample opportunity to practice chewing. If you feel you baby is still not comfortable, give small slices of banana – ensure they are cut into thin slices. Well-boiled potato and carrot cubes. Cut soft idli into tiny pieces and offer. Hi..my baby is 11 months old…how to make idly sambhar for him..like what spices and how to ferment the idli?? For 11 months old, I would suggest just make plain dal with vegetables with a little salt and haldi and maybe pepper. Sambhar powder might be too hot and spicy for such a little baby. 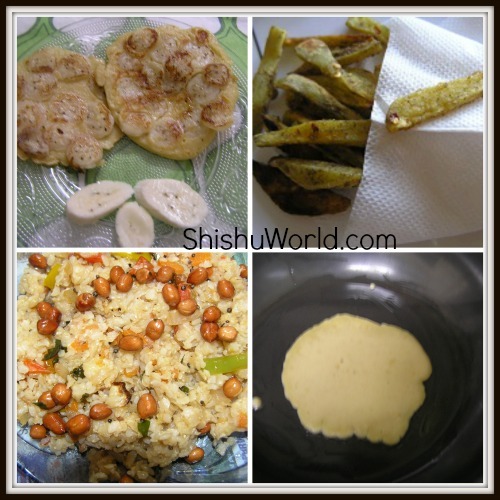 You can make idlis the regular way. Soak equal quantities of dal and rice for couple of hours, grid them and let the better ferment overnight. In the morning, use it to make idlis. Is dosa/parantha/idli not too dry for baby to be given at this age? You can give as your baby is comfortable. At this age, baby’s sambar is just dal and some vegetables cooked together without spices. Dip the idli or dosa in this and give it to baby. If you want you can also mash it with dal and give. if baby is not taking hen what to do? Thank you for creating the blog. How can I feed chapathi to my 11 month old baby? There are lot of opinions by elders at home, would love to hear from you. I started feeding chapati by breaking it into small pieces and mixing it with dal, milk etc. It makes the chapati soft and easy to chew. My son has not developed a single teeth yet. so lil worried about solid food like idli or chapati. Can we still feed him all these? Yes, you can. Just mash the food and soften it in dal or sambhar.